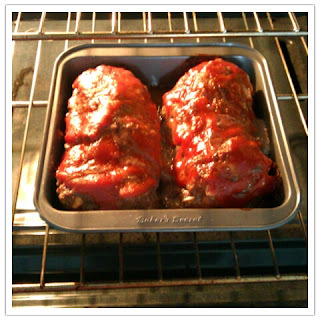 Jimmy suggested I make meatloaf for dinner one night. I refused. I made it in Hawaii once and it was a FAIL. But.. if this really is fool proof, I'm in! I bookmarked the recipe, so we'll see how it turns out! jobi LOVES this! i've made it for him three times, and they have each come out a bit differently. 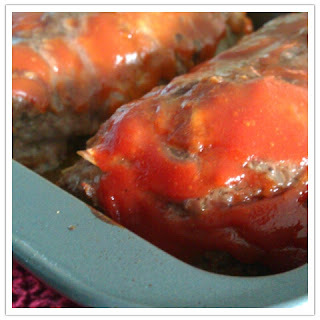 i think if you'd like the meatloaf soft, use a lot of bread, and don't bake it completely. i used 2 fat (stale) rolls and baked it for 45-50 minutes when it was the juiciest and softest. and it wasn't red at all. you don't need onions; you don't even need salt and pepper. if you think it may be ruined, make lots of extra sauce to go over the top. i swear the sauce will make up for any imperfections. hope jimmy likes it. ;-) good luck!